Well used & loved board, it’s been both a mode of transport and a fun ride, especially effective for navigating the length of Oxford St rapidly. The original Seismic trucks failed after ten years service and replaced with the Gullwing Charger 50˚ trucks, which brought new life to my board, they were smooth and responsive, brilliant for carving. I loved the Seismics but the Gullwings were even better. I wish Lush still made that board shape, it’s such a great board to ride. Everyone who ever tried it (even non skaters) comment on how easy it is to ride. 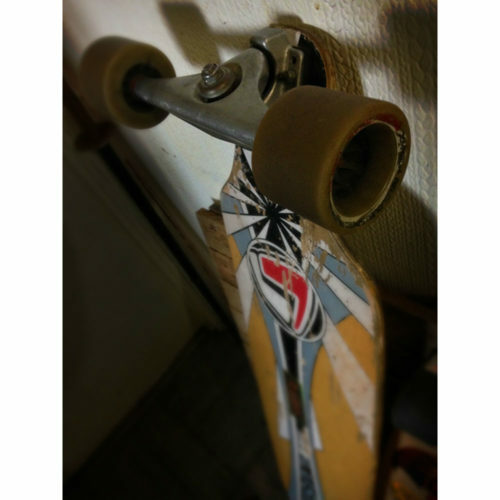 Great board Lush, thank you for getting me into longboarding, the moment I walked into that skate shop and saw the Samba, I knew I had to have one. Oh & the Avalanche wheels have been amazing too, just the right grip/slip ratio.